Another possible three-win day, starting with two college football matchups as West Virginia (-3) and Ohio (-2) are both favored. In the second time-slot you can stick with college football or switch over to the NHL. In football, Bowling Green (-1) is favored at Toledo, and Colorado and Nebraska battle it out in a "total points" matchup. For hockey, the Coyotes (-105) and Ducks (-110) are favored to win their games and our evening NHL matchup features the Penguins on the road at the Sabres (-105). NCAAF (Fresno St @ #9 Boise St): How many POINTS WILL BE SCORED in the game? Boise State looks to make a case for a BCS bowl bid tonight when they take on Fresno State at 6:00 p.m. ET on ESPN2. The Broncos are listed as 21-point favorites therefore The StreakMaster put a "total points" matchup on the board with the line at 57 points. The StreakMaster likes the under here because of all the pressure that will be on Boise State. Although, the Broncos still pull it out, winning 28-27. Streakers must have been too busy cooking and eating instead of researching matchups. The overall winning percentage was one of the lowest in streak history at 29.5 percent. The Arizona Cardinals were the big streak breakers, losing to Philadelphia Eagles team who really came ready to play. Bigsam1122 is still at the top of the leaderboard with 23 wins in a row, and with some streakers in the high teens going down, he is gaining some separation up there. Happy Thanksgiving everyone! We have a few "total points" matchups in the NFL, with The StreakMaster leaning towards both "over's." There are a couple of soccer matches on ESPN360 as well, with The StreakMaster taking the "draw" teams in both. Don't forget the NBA, with the Hornets at Nuggets (-2), either. A possible 3-win day for Streakers! It is hard to believe the Cardinals are underdogs in this one, with the drama filled week the Eagles had. Vegas has the Eagles favored by two, but the Cards should bounce back after last week's loss to the Giants and win this one on the road. Another rough day for Streakers, who finished with a 41.3 overall winning percentage. The top streak breaker was Chelsea who gave up a late goal to Bordeaux, in a match that finished with a draw. Our leader is still at 23 wins in row! Aaron Rodgers attended Pleasant Valley High School in Chico, CA. Another Streaker going for 25, another one gone. The StreakMaster strikes again! Too bad he has another Streaker coming for his million, with "bigsam" now at 23 wins in a row. Both offenses look solid tonight, but the Saints take a 24-21 lead going into half number two. Can the Pack come back on the road? Stay tuned to find out! Do you think "gmreynolds" has a voice left? "gmreynolds" wasted little game and is going for the win on "Monday Night Football!" Will his hometown hero, Aaron Rodgers lead him to the promise land? Or will Drew Brees pick apart the Packers defense? This one should be a nail-biter! There have been plenty of people on the message boards trying to give "gmreynolds" advice and asking questions about his methods. People want to know if he will wait for a "gimmie" or wait for the weekend games. Many message board posters want to know if he will go with his current hot streak and pick tonight. "gmreynolds" is the only person who knows the answers to all these questions, but one thing is for sure, the pressure is all on him. 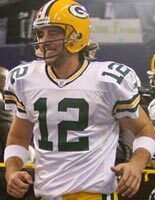 Little known fact: Packers quarterback Aaron Rodgers and our leader are from the same home town. I mean with that connection, you take the Packers, right? P.S. Since when did The StreakMaster become the most hated person on the internet? Two .500 teams own the only matchup on our board. 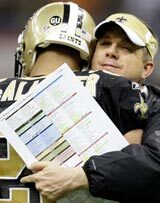 The Saints are favored by one but Reggie Bush is not expected to play, so this one could go either way. The StreakMaster will not suggest a pick tonight because he doesn't want his record to be shattered! This weekend was by far the most entertaining in streak history. The overall winning percentage was a solid 67.6 percent but two potential $1 million winners went down thanks to the Atlanta Falcons. gmreynolds71283 is sitting pretty with a two game cushion and a streak of 24. The StreakMaster is holding on by a thread, we'll see how long his record can last. What a run by sfniners_1 but we have a new leader, whom is now only ONE win away from a life changing amount of money. The question now is, what pick will JFulk89 make next? Wow, what a day it has been. We now have two leaders at 23 wins in a row, JFulk89 and sfniners_1. JFulk has chosen the BC Eagles while sfniners picked Wake Forest. The Demon Deacons are favored by 1.5 points, but with a spread that close, anything can happen. Keep checking in with us! What a day this could be! Will sfniners_1 make a pick today? We shall see. Our first ever Rugby match hits our board with England (-110) hosting South Africa (-110). Our featured English Premier League match features Arsenal on the road against Manchester City, whom are favored with the draw at home. For college football games, Clemson (-2.5) is at Virginia, Boston College is on the road at Wake Forest (-2.5), Oregon State is at Arizona (-2.5) and Florida State (-1.5) is at Maryland. In the NHL, Atlanta should be able to take care of Columbus at home. Not only is SportsNation picking Oklahoma to win but Vegas thinks so too, making the Sooners a seven point favorite. Seven points seems a little too high for a big game like this, but the Sooners hardly ever lose at home. This one is too close to call, so The StreakMaster won't make a pick to jinx any Streakers. Another highly successful day for Streakers, whom netted a 73.7 overall winning percentage. Once again, there was no big streak breaker, but what we do know is that the top of the leaderboard is getting packed. Scott now has two Streakers with 21 wins behind him. He must be feeling the pressure now! Scott Conant was interviewed by ESPN's Jon Anik in Bristol on Friday night and talked about his amazing streak to 23 wins. Watch the video. Our leader will be on multiple ESPN broadcasts throughout the weekend, so make sure you check our main page to find out where he will be next. Good luck, sfniners_1 you're going to need it! Chat With The StreakMaster AND sfniners_1 This Afternoon! Our Streak leader will be joining The StreakMaster in his weekly chat at 3:30 p.m. ET. Be sure to stop by if you have any questions or suggestions for our leader or if you have any ideas how The StreakMaster can take him down! The StreakMaster with the million dollar paycheck! Even with a losing record at home (2-3-4), the Tampa Bay Lightning (-118) are favored to beat the Nashville Predators. The StreakMaster disagrees with that line and will go with Nashville. Our next NHL pick is the best bet of the day with the Anaheim Ducks (-121) favored on the road against the St. Louis Blues. The Indiana Pacers have been slipping as of late, and it doesn't help that they have to play a solid Magic team. Orlando is favored by two points on the road and The StreakMaster predicts a win by at least eight. Also, expect a big (fantasy!) game from Dwight Howard. sfniners_1 didn't make a pick last night, because he is on his way to ESPN studios in Bristol, Connecticut! He will be joining us today in studio and hopefully he will be able to make a pick on one of our shows. Stay tuned for more information! By the way, the overall winning percentage for the day was a low 42.5 percent thanks to Georgia Tech's victory over Miami (FL). According to multiple reports, Yao Ming will most likely sit out tonight's game against the Mavericks due to an ankle injury. 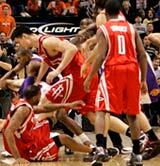 Tracy McGrady has also told multiple websites that Yao will not play. Our matchup has been taken off the board as a result. Dan LeFevour needs to have a big game tonight for Central Michigan. If Ball State can take down Central Michigan tonight, they should be able to finish the season undefeated. With that being said, The StreakMaster thinks the Cardinals are going down to a quality Central Michigan team. In the Las Vegas Sports Consultants poll, Ball State is not even ranked as one of the top 25 teams in the country. The StreakMaster can see this is due to their light schedule. The StreakMaster sees this game coming down to the wire, with Central Michigan pulling the upset. Central Michigan has won six straight and look to take down undefeated Ball State tonight. The over/under is 54.5 and Central Michigan games have been "over" in three out of their past four games. With a predicted Central Michigan win, The StreakMaster likes 55 or more here. For NBA games, The StreakMaster is on the Jeff Green (fantasy!) bandwagon in Oklahoma and expects a win by the home team (pick 'em) as well as a Nuggets (pick'em) win over the Spurs. NBA (Dallas at Houston): Who will total more points and rebounds in the game? Josh Howard is starting to find his groove, scoring 20 or more points in his past four games while averaging nine rebounds per game in that span. Also, Yao Ming will be playing tonight with a sprained ankle. The StreakMaster likes Howard in this one. Not a lot of movement on our leaderboard with an overall winning percentage of 62 percent. As The StreakMaster predicted, the Hawks were taken down by the Pacers, earning themselves as the day's top streak breaker. Our leader is still at 22 wins in a row! 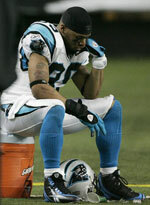 Kerry Collins, MVP candidate and our leader's new favorite player. Two things that I thought would never happen, are now reality. I give our leader, sfniners_1 a lot of credit. 22 straight wins is very impressive, but with success comes pressure. Imagine being only three picks away from one million dollars? You can't tell me this guy is sleeping comfortable through the night. Also, NFL fans and analysts are starting to think about who the league MVP is and the name on top of lists so far is Kerry Collins. Can you believe it? The guy can still play and at a high level, for that matter. That being said, there is still a lot of football to play, so I cannot give him my vote just yet. P.S. How 'bout them Giants? A "total points" prop starts off our slim board at 8:30 p.m. ET -- the Cleveland Browns vs. Buffalo Bills, with the over/under at 41.5 points. As the only football game on national television and Brady Quinn taking the snaps for Cleveland, The StreakMaster predicts the over. Our NBA prop at 9 p.m. ET features a "more points" battle between Amare Stoudemire and Carlos Boozer, with Streakers so far favoring the Suns forward. Both AFC teams desperately need a win tonight to stay in playoff contention. The Bills are favored by five at home but the Browns have the players and the potential to pull out a big win. It should be a great game to watch. Streakers took care of The StreakMaster once again, netting a 68.9 overall winning percentage. Our leader sfniners_1 now has the record with 22 wins in a row. With no major streak breakers yesterday, our leaderboard is starting to see a lot of high streaks. We starts the day at 11:48 a.m. ET with a matchup between Lorena Ochoa and, well, Lorena Ochoa. Ochoa shot a 73 in the first round of her own tournament but that number should be lower today. The StreakMaster put the over/under at 69.5 for her second round score. In our only NHL matchup at 7:30 p.m. ET, the Carolina Hurricanes are at the Atlanta Thrashers (-105). The StreakMaster also added some NBA props for tonight's games on ESPN. First, red-hot Paul Pierce goes against Carmelo Anthony in a "more points" matchup at 8:05 p.m. ET. Kobe Bryant (points) takes on Allen Iverson (points + assists) at 10:30 p.m. ET. The Lakers should win by 10 and The StreakMaster likes Bryant in this one. Even though the Bearcats are on the road, Vegas has them favored by four and rightfully so. Cincinnati is clearly the better team here, and The StreakMaster expects a 10-point win but in the shaky Big East Conference, this game could have upset written all over it. Streakers finished with a 49.7 overall winning percentage with the New England Patriots as the top streak breakers of the day. The StreakMaster still can't believe Randy Moss made that touchdown catch. No movement on the leaderboard, but that will change once the weekend rolls around. Be sure to stop by and chat with The StreakMaster today at 1 p.m. ET. Brandon Jacobs and the Giants destroy another big time streak, this time with a win. We, at Streak Headquarters always talk about what goes through the minds of Streakers who hit the 20 win mark. 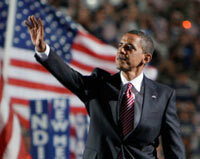 Personally, I think it would be great to have a webcam setup to watch a leader with 21-22 wins, until he or she loses. You can't tell me that Streakers who get to 20 plus wins, are not over-thinking every pick and researching their next pick for hours or maybe even days. We now have had two Streakers who reached the 21 win mark. Maybe, a curse of 21 is beginning to form! Past leaders, let all of us know what goes through your head when you are a few picks away from a life changing amount of money. With large lines in the NBA and NHL today, "Monday Night Football" takes control of our board. Our first prop features a "total points" matchup with the over/under currently set at 47.5 points. The StreakMaster expects a shootout here, so expect a high number of points, especially from the Cardinals. Our Arizona-based prop features the Cardinals' total points against Amare Stoudemire's points. Stoudemire and the Suns play the Memphis Grizzlies. Stoudemire should have a big game against a weak Memphis frontcourt but I don't see him beating out Kurt Warner's Cardinals. MNF (SF at ARI): Which running back will have a HIGHER TOTAL? The StreakMaster put up his new favorite running back, Tim Hightower's total yards -- which is projected to be around 95 yards -- against Frank Gore's rushing yards. Gore is projected to have around 80 rushing yards but with this game expected to be a shootout, anything is possible. Overall, a very nice day according to The StreakMaster. The overall winning percentage was a decent 51.1 percent but the big news was our former leader going down with his Eagles pick. May this be a lesson to Streakers, never go against the Giants when it comes to perfection and/or $1 million! Our "straight up" matchups at 1 p.m. ET, feature the Ravens (-1) at the Texans and the Saints (+1) at the Falcons. The props include a "more rushing yards" matchup between two of the leagues best rookies, Chris Johnson and Matt Forte. Also, Trent Edwards faces Matt Cassel in a "more passing yards" matchup. In the 4 p.m. ET slot, The Colts are in Pittsburgh, taking on the Steelers (-3). Also, DeAngelo Williams of the Panthers goes up against the Raiders total rushing yards, since he is projected to rush for over 100. Two of the leagues best tight ends also square off in a "more receiving yards" matchup with Tony Gonzalez against Antonio Gates. Our Sunday night prop is between Brandon Jacobs and Brian Westbrook in a "more rushing yards" battle. In NBA action, the Pistons (-1.5) host the Celtics and in the NHL, the Devils (-103) host the Oilers. The Giants are in Eagle country for this very meaningful NFC East showdown. The Eagles needs to beat the G-Men to not only have a shot at winning their division but improve their playoff hopes. The StreakMaster thinks the winner will be the team with the ball last. Streakers bounced back nicely, finishing with a 70.7 overall winning percentage. With no major upsets on the board and a victory for Texas Tech, our leader is now at 21 wins in a row. Let' s see if he can keep it up! We welcome back the popular "largest margin of victory" prop at noon ET. The matchup is between two Big Ten teams, Minnesota and Ohio State. Currently, Minnesota is favored by 8.5 over Michigan while Ohio State is favored by 11 on the road at Northwestern. In Big 12 action, at 2:30 p.m. ET, Kansas is on the road at Nebraska with the Cornhuskers favored by one. Wake Forest (-3.5) is favored at home against Virginia at 3:30 p.m. ET, and No. 1 Alabama (-3.5) is on the road at LSU. Our prop for 3:30 p.m. ET features a "more points" matchup between favorites Florida State and Penn State in their respective games. Notre Dame is on the road at 8 p.m. ET against Boston College with the Eagles favored by 3.5, but The StreakMaster likes the Irish in this one. In the must-see game of the night, No. 9 Oklahoma State looks to pull off an upset on the road at Texas Tech. The Red Raiders are favored by four, but The Streakmaster likes the Cowboys in this one to kick off another "November to Remember." What a disastrous day for Streakers! The overall winning percentage was an unbelievable 16.9 percent. The StreakMaster couldn't be more happier heading into the weekend. Now if the Streakers at 20 and 19 could only lose. I like the million dollars where it is...on MY table. 41 points for LeBron last night, I saw that coming. Ben Gordon scores 31, my fantasy basketball sleeper (Yes, I called it, ask Keith Lipscomb). With those guys going off, and my wins per month at 11, you would think I would be sleeping great, but it's only the complete opposite. With Streaks at 20, 19 and 18, it has been very difficult choosing proper matchups that fit the right criteria. Rest assured Streakers, once I knock these guys down, the boards will be full again! By the way, my weekly chat time has been changed to 12:00 p.m. ET, instead of the usual 1:00. Now, you can chat with The StreakMaster for a full hour! I expect all of my Streakers to be there, consider it an early Christmas present. A whole Streak board dedicated to football! Leading our primetime matchups is a possible upset special at 7:30 p.m. ET when Virginia Tech (-2.5) hosts No.23 Maryland. The Hokies are 3-0 this season at home and since it's Thursday, I see the ranked Terrapins going down. Our second college football game features two outstanding teams from the Mountain West Conference battling for a possible BCS spot. No.11 TCU is on the road at No.9 Utah, with the visiting team actually favored by 1.5. TCU's only loss was to Oklahoma and they already beat previously unbeaten BYU. Therefore I give them the edge in this one as well. As a longtime Brady Quinn fan, I have been waiting for this day for a while. No. 10 gets the start against the struggling Broncos and the Browns are favored by 3.5 points. I really thought Denver was going to be a Super Bowl contender this season but a loss tonight could ruin their chances for a playoff spot in the AFC. Yesterday's Results: While our leader still sits on 20 wins, the Streakers who did play some matchups today had a rough time, only scoring a 41.7 overall winning percentage.The top streak breaker of the day was the "total goal" matchup in which Manchester United and Celtic could not find the net, ending the game in a 1-1 tie. The StreakMaster already has 11 wins this month! 2007 Big East co-champions square off in Connecticut with West Virginia (-4) favored over UConn at noon ET. Also, Wisconsin looks to salvage their season when they take on Michigan State on the road at noon ET with the Spartans favored by five points. Pittsburgh takes on Notre Dame in South Bend at 2:30 ET, with the winner most likely making it into the top 25 next week. The Irish are favored at home by five points. Florida State travels to Georgia Tech at 3:30 p.m. ET in conference play. Georgia Tech is actually favored by two points but a win by the Seminoles would solidify their spot in the standings. 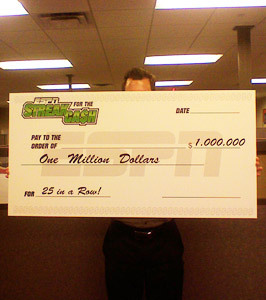 The Stanford 20/20 for $20 Million takes over our board with Stanford's Super Starts versus England at 5:30 p.m. ET. England is favored to win the finale with a minus-140 line. In NBA action, the Hawks (-2) try to stay perfect when they host the 76ers at 7:05 p.m. ET. Then the Raptors are on the road at 8:30 p.m. ET in Milwaukee. Toronto is favored by two points. The battle of Texas is on, with the No. 1 ranked Texas Longhorns on the road to face the No. 7 Red Raiders. Texas is favored by 3.5 points on the road, and if they can get past high-scoring Texas Tech, they should coast to the Big 12 championship. Expect a high scoring game with Texas pulling it out, 41-31. Yesterday's Results: The overall winning percentage was an average 54.9 percent. Congratulations to our October wins per month winner, louye1128, who had 62 wins in 31 days with a .692 overall win percentage!